In the immediate aftermath of Hurricane Matthew, Sigora was on hand to support emergency relief efforts. Now the clean energy microutility is raising $96k and leveraging its supply chain, private sector networks, and local community ties to get critical assistance to remote communities where it’s needed most. 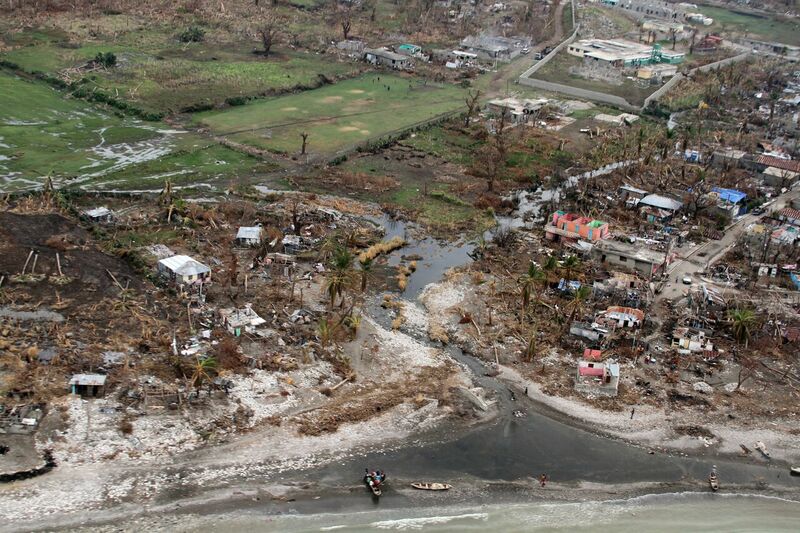 Port-au-Prince, Haiti – Sigora International, a California-based clean energy start-up operating in Haiti, is raising $96,000 to get critical shelter supplies, clean water, and agriculture inputs to 10,000 people in hard-to-reach areas following the devastation caused by Hurricane Matthew. Three weeks after the category four storm slammed the country’s western coast, emergency aid has yet to reach tens of thousands of people living in rural areas. In the most remote communities, families are facing a fourth consecutive week without food, clean water, or adequate shelter. Sigora Haiti – the deployment subsidiary of Sigora International – has been active in Haiti since December 2015 when it started construction of its first micrgorid. In six months, the company built an entire electrical grid from the ground up. Today, the microutility services the entirety of Mole Saint-Nicolas, a 5000-person town that never before had electricity, and expansion is underway to bring electricity to 300,000 people by the end of 2017. In the immediate aftermath of the hurricane, Sigora mobilized staff across the country to support emergency relief operations. In Mole, a team assembled and distributed relief packages to the town’s most vulnerable residents. Meanwhile, a team located in Port-au-Prince worked with a dedicated group of local private sector and grassroots organization partners to distribute 10,000lbs of food aid and 200,000 water purification tablets to hard-hit communities in the southwest. Following the hurricane, Sigora made trips to the hard-hit regions of the southwest departments to assess the damage to the electrical grid networks. There, they met with dozens of families who, despite the large-scale relief effort, still had not received any help whatsoever. To help fill a critical gap in the response, Sigora has launched a Go Fund Me campaign to raise $96,000 to provide 10,000 people with the means to permanently repair their homes damaged by the hurricane; purify enough water for the next three months, and plant a hardy food and cash crop. “We’ve seen houses devastated by the storm, with the need for repairs that can very easily be done by the local people. We saw a desperate need for water purification, we’ve seen people’s farm plots destroyed. Everywhere we’ve gone it’s the same thing” says Andy. All inputs for the relief kit, except for the water purification tablets which are purchased from overseas, are sourced locally and support the local economy. Ayiti Natives Co. – a Haitian-owned company and the premier producer of Moringa products – is producing the agriculture kits and has committed to buying back all the pods brought to maturity as part of this campaign. By planting this crop, families will have a guaranteed future income as well as a nutritious food staple. Sigora is not waiting until it reaches its fundraising goal to begin distribution. Teams are on the ground working with local partners to identify vulnerable families, visiting each to verify and assess the damage to their home and record their GPS coordinates to be able to return with supplies. Sigora is covering all the soft costs related to the campaign, every dollar that is donated goes towards reaching people in need. “I am a businessman. I don’t believe in long-term aid. This campaign is not that. This is the need to help fellow humans when they are down, and these people are seriously down right now” says Andy. To date, the campaign has raised $31,404 through the generous support of 98 people in 7 days.